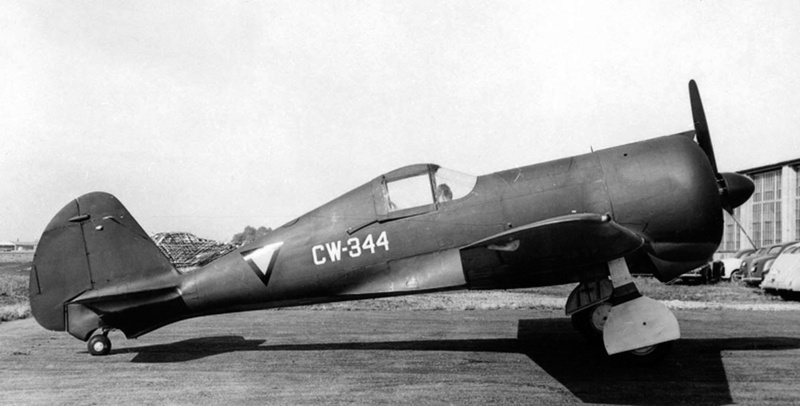 The Curtiss-Wright St. Louis division developed the model CW-21 to the specifications of William Douglas Pawley – well known entrepreneur and founder of the Chinese ‘CAMCO’ (Central Aircraft Manufacturing Company). Pawley had eye-witnessed Japanese raids on Chinese targets and decided that only a fast climbing single seat ‘interceptor’ could be effective against the attacking bombers and fighters. However, in April 1939, China ordered 30 CW-21’s, to be assembled by CAMCO. By that time the Dutch government was frantically looking for any fighter available in the market. After a demonstration of the CW-21 prototype they asked for a number of modifications (such as inward retracting landing gear) and in April 1940 ordered 24 CW-21b’s. The German Wehrmacht invaded the Netherlands before deliveries could be made so the contract was transferred to the Netherlands East Indies government. With its light construction, radial engine, low wing loading, limited pilot protection and lack of self-sealing fuel tanks, the CW-21B was the Allied fighter most similar to the opposing Japanese fighters. It had a rate of climb superior to the Nakajima Ki-43-I (“Oscar”) and Mitsubishi A6M2 Zero. The CW-21B had similar firepower to the “Oscar”, but worse than the cannon-armed Zero. The lightweight construction of the Curtiss-Wrights gave rise to structural problems, and several aircraft were grounded by cracks in the undercarriage, and were still awaiting repair when war with Japan began on December 7, 1941. According to one source only nine CW-21Bs were operational on that day. The 24 CW-21Bs were assembled at Andir airfield, Bandung, Java in February 1941, equipping Vliegtuiggroep IV, Afdeling 2 (“Air Group IV, No. 2 Squadron”; 2-VLG IV). under 1/Lt. R.A.D. Anemaet and numbered eighteen CW-21Bs. Twelve were initial strength and six in immediate reserve. Soon after its formation the squadron relocated to Maospati in eastern Java. where the squadron engaged in operational training. The CW-21Bs alternated acting as escorts and intercepting Royal Dutch Navy Dornier 24’s. Less frequently there were exercises of the air warning system with Dorniers or Martin bombers playing the role of enemy attackers. One pilot was lost when he ran into the ground flying low in an air show. The CW-21Bs themselves suffered some minor structural damage during training manoeuvres. The weakened 2-VlG-IV was dispersed in December 1941. Two flights went to Tjilitjan in western Java. Two others moved to Soerabaja/Perak in eastern Java. The CW-21Bs in western Java were periodically tasked to deploy to Palembang in Sumatra to stand alert to cover convoys passing through the Sunda Straights. On 15 January 1942 eight CW-21Bs joined ten Curtiss Hawks and 14 Brewster Buffaloes in a scramble to intercept Japanese bombers approaching Palembang. The Dutch fighters failed to make contact. The same day the CW-21Bs returned to Java. As Japanese advances forced the Dutch out of Singapore and Borneo, Brewster Buffaloes withdrew to their home bases in western Java. This allowed 2-VlG-IV to concentrate in eastern Java. On 20 January 1942 the squadron was reunited at Perak with a strength of 14 operational aircraft. There it flew several false alarm scrambles. As February began the CW-21Bs still had seen no combat. Japanese navy Zeros made a fighter sweep over eastern Java on February 2nd but the CW-21Bs based at Surabaya/Perak were not engaged. On the following day there was a large Japanese raid. Twelve CW-21Bs were among the 25 Allied fighters scrambled. Unfortunately the CW-21Bs were dispersed in three separate formations in different patrol areas incapable of mutual support. 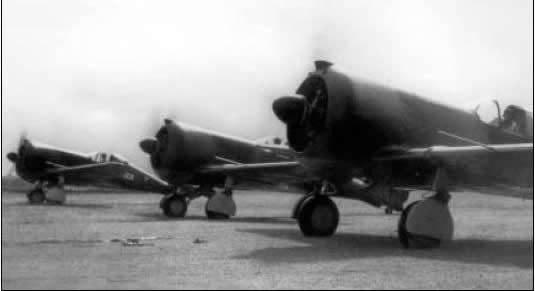 On this day both Zeros of the Tainan Air Group and 3rd Air Group engaged the Allied fighters but the twenty-seven Zeros of the 3rd Air Group saw the bulk of the action and claimed 33 fighters shot down including 15 “Curtiss-Wrights” or “Curtiss” fighters as distinguished from P-36s, P-40s, Buffaloes and other types that they also claimed. In addition to the CW-21Bs the only other Allied fighters involved were U.S. P-40s and Dutch Hawk 75As . One flight of four CW-21Bs found itself under attack from behind by an estimated sixteen Zeros. The formation leader, 2/Lt. J. Kingma, turned into the attackers but two members of the flight went down in flames in the initial assault. Kingma claimed two of the attackers before he was shot down and saved himself by bailing out. Sgt. H.M. Haye also claimed a Zero but returned to base in a badly damaged fighter. A second flight consisted of only three CW-21Bs after the fourth member was delayed in take off. Zeros also jumped this flight. Without inflicting any loss on the enemy, one CW-21 went down to a crash landing and two others landed in a damaged condition one with a badly wounded pilot. The fourth member of the flight mistakenly joined up with Zeros instead of his flight companions. Ens. D. Dekker claimed to have scored hits on a Zero before others sent him down in a crash landing. The third flight under Anemaet did not encounter enemy aircraft until it was surprised while landing at Perak. One CW-21 was shot down and two others landed safely. Anemaet landed but ran into a bomb crater being unaware the Japanese had bombed the airfield. The leading Japanese pilot on this occasion was the 3rd Air Group’s Warrant Officer Sadaki Akamatsu, a top-scoring ace, whose flight claimed five Curtiss fighters as well as other kills during this action. The 3rd Air group lost three pilots and some or all of these may well have been victims of 2-VlG-IV. Two days later the Interceptors were again taken by surprise and confronted overwhelming odds. Anemaet led just four CW-21Bs into the air. Their opposition was 27 Zeros of the Tainan Air Group. The Dutch pilots reported being attacked by 26 fighters. They had no opportunity to dogfight but in taking evasive action Anemaet claimed a Zero shot down. One CW-21B went down in a crash landing and one returned to base badly damaged. With twelve aircraft destroyed or badly damaged 2-VlG-IV was temporarily hors de combat. Within a few days reinforcements and the repair of two aircraft brought the strength of the squadron to six aircraft. Hurricanes were arriving in Java to equip the Dutch squadrons and Anemaet was ordered to take 2-VlG-IV to Andir in western Java to reform on Hurricanes with the CW-21Bs operating as an attached flight. A few days later the squadron moved to Kalidjati not far from Andir. In western Java the CW-21Bs encountered the Japanese Army Air Force and suffered its first losses at their hands. Two CW-21Bs under repair at Andir were lost in a bombing raid probably on 19th February. February 24th proved another dark day for the CW-21Bs. Four of them scrambled along with Hurricanes of 2-VlG-IV. Twenty-seven Type 1 fighters of the 59th and 64th Flying Regiments reported encountering seven Hurricanes and two “P-43s.” Both CW-21s were lost with Ens. D. Dekker killed and Sgt. H.M. Haye crash-landed. As if this were not bad enough Lt. W. Boxman, the Interceptor flight leader, was shot down apparently by friendly ground fire and a fourth CW-21B was destroyed on the ground in a subsequent bombing attack. On Java the military situation for the Allies was going from bad to worse. On February 28th/March 1st Japanese troops came ashore in both east and west Java. On the 1st of March CW-22 Falcon general purpose/reconnaissance aircraft were pressed into service as light bombers. At Maospati airfield two CW-21Bs in storage were destroyed by Allied troops to prevent them from falling into Japanese hands. In western Java the CW-21Bs were still operating and on March 2nd four of them scrambled with three Buffaloes of 3-VlG-V to confront about twenty Type 1 fighters of the 59th Flying Regiment. During this fight Lt. Boxman bailed out of his stricken Interceptor and was badly burned. His was the only Dutch loss. One Type 1 fighter also failed to return. This last combat mission did not signify the last flight of the Interceptor. 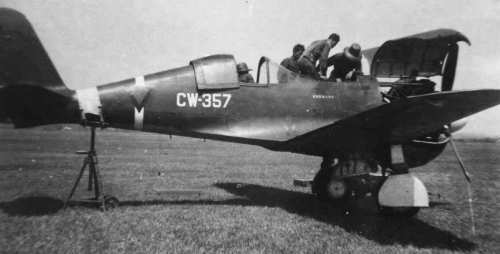 At least one CW-21B was captured by the Japanese in a condition capable of flight operations. One CW-21B was shipped to Japan. It was sent to the test center at Tachikawa, adorned with the tail markings of that organization, and flown there. 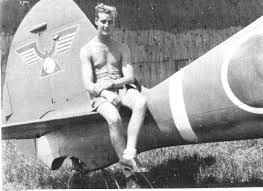 A British serviceman photographed sitting on the tail of a CW-21b found intact at Singapore-Kallang in 1945. The machine had probably been used as a courier plane. The British found an intact CW-21B at Singapore in 1945. It bore the tail markings of the Tachikawa test center and may have been the same aircraft sent to Japan in 1942.